Russian Foreign Minister Sergey Lavrov said that Syria and Russia have frequently warned of preparations by terrorists to initiate provocative acts using chemicals against civilians with the aim of accusing the Syrian state. 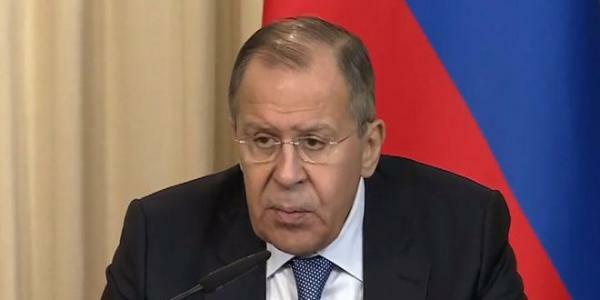 In a press conference held on Monday with his Tajik counterpart Sirodjidin Aslov in Moscow, Lavrov pointed out that what is being broadcast by some media outlets regarding the allegations involving the use of chemicals in Eastern Ghouta and the images that show how the allegedly affected people were being treated by unprotected people reminds us of former shots broadcast by the so-called “White Helmets”. Lavrov stressed that the aim of what happened in Eastern Ghouta is to launch a comprehensive campaign that targets Damascus as well as Moscow and Tehran, pointing out that Russia supports conducting a serious and non-politicized investigation into the use of chemicals. He wondered about how the US President Donald Trump and his French counterpart Emmanuel Macron could quickly exchange evidence on the use of chemicals in Syria when Russian experts and representatives of the Syrian Arab Red Crescent have not found any traces of chlorine or any other gases.